Lady Celia is the youngest of the Sharpe siblings and the last to find a spouse. Her family, mainly her grandmother, believes she is not marriageable material- it is not fashionable for a lady to know her mind, be outspoken, stubborn, or shoot better than any gentlemen in the ton. Wanting to prove her family wrong, she sets out to find a suitor and ends up with more than she knows what to do with, but the one she wants is not one of them. Jackson Pinter struggles to hide his attraction to Lady Celia while he works for her family and researches the mystery that surrounds her parent's deaths. He is shocked when Celia asks him to do some research on her suitors, not only does he not want to see her married to anyone but him, he certainty does not want help her do the job. After being thrown together, they eventually find themselves alone in a cabin in the woods with desires that need sating. Will one night of passion be enough to force Jackson to see past their difference in station? Or will his stubbornness about their differences keep them apart? Now, A Lady Never Surrenders was...a little disappointing for me. I was hoping for more, but it was still a solid story. The relationship between Celia and Jackson has been slowly building throughout the other books and it was nice to finally see them together. 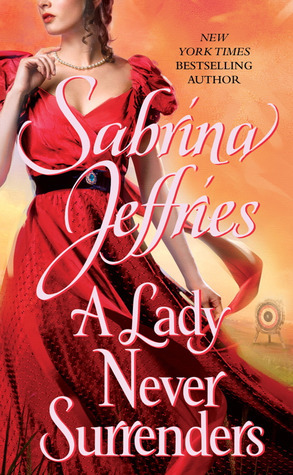 A Lady Never Surrenders also being about the end of the mystery of the Sharpe sibling's parent's death. The explanation was a bit weak for my taste, as previously stated, I was hoping for more. If you are a fan of historical romance, this series is just right for you. Sabrina Jeffries's characters are individuals and none adhere to the stereotypes of the day. Each book stands alone, though they are linked together with similar themes. I can't wait to start next within the series, 'Twas the Night After Christmas (Hellions of Halstead Hall #6) - perfect for the holiday season! I'm excited!